Stuart Levine was educated at Harvard (AB) and Brown (MA, PhD), and has been a professional concert musician, network music commentator, scholarly author and editor, journal editor, lecturer and teacher. In 1994-1995 Levine was Professor Emeritus of English, University of Kansas. During his years of service at the University of Kansas, he was frequently a visiting or exchange professor at other universities. He also held Fulbright professorships in Argentina, Costa Rico, Mexico, Chile, and Italy. At the University of Kansas he founded the American Studies Department, and was the first chairperson, and the scholarly journal American Studies, which he edited for thirty years. He was an active Poe scholar, and published The Short Fiction of Edgar Allan Poe/An Annotated and Edgar Allan Poe/Thirty-Two. Nancy Oestreich Lurie is a distinguished American anthropologist who specializes in the study of North American Indian history and culture. She received her BA from the University of Wisconsin–Madison, an MA in Anthropology from the University of Chicago, and a PhD in Anthropology from Northwestern University. Lurie was a professor of anthropology at the University of Wisconsin-Milwaukee, a visiting scholar with a Fulbright-Hay Lectureship in Anthropology at the University of Aarhus, Denmark, and head curator of anthropology at the Milwaukee Public Museum. As a result of research in Indian claims she became an active voice in the development of the field of ethnohistory. Lurie was appointed to the State of Wisconsin Historical Preservation Review Board, served on review committees of the National Endowment for the Arts and National Endowment for the Humanities and was a member of the board of trustees for the Center for the Study of American Indian History of the Newberry Library in Chicago. She received research grants from the American Philosophical Society, National Endowment for the Humanities, National Science Foundation, University of Chicago Lichtenstern Fund, and Wenner-Gren Foundation for Anthropological Research. 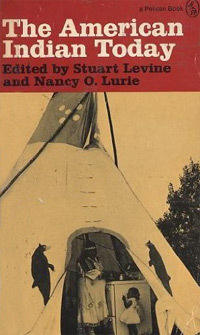 In 1983 Lurie was elected President of the American Anthropological Association. In 2006 she received the Association’s Franz Boas Award for Exemplary Service to Anthropology.